Supporting graphics for most of the bullet points provided in 24 charts and tables. For those of you who want a feel for why we have our market view and why we believe the allocation changes are appropriate; the bullet points will help. If you want to see what data is behind most of the bullet points, you will want to look at the 24 supporting graphics. There is an unfortunate need to use some jargon in the bullet points and graphics which may be unfamiliar to some of you, so please call or write in to have any of them explained; and to discuss their significance to portfolio decisions. Major world equity markets are in up trends — but there is mounting evidence that the US markets are over-extended and significantly vulnerable to a meaningful downward adjustment based on a combination of valuation, breadth, possible turmoil from key elections in Europe; and as Goldman Sachs puts it “rhetoric meets reality” in Washington. Downside risk exists, but while the trend remains upward, we are remaining invested. 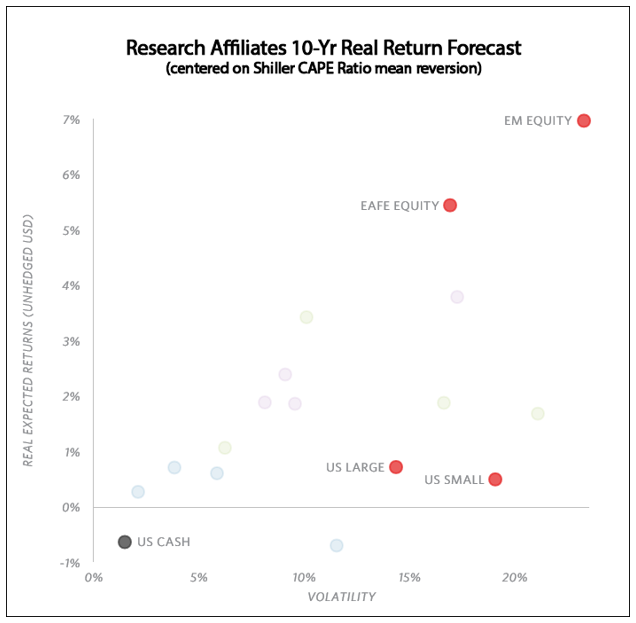 However, we are not committing additional assets from cash positions to US equity risk positions at this time (except for dollar-cost-averaging programs) due to the elevated vulnerability of the US stocks market. We will be transferring some of the US equity risk assets in portfolios to some international markets that are in intermediate-term up trends that offer better valuation opportunities. Portfolio changes or recommendations will be framed within the strategic allocation policy level of each client which varies based on individual needs, goals, stage of financial life, preferences, risk tolerance, and other limits or factors. Based on valuation and long-term forecasted returns, US stocks exposures will transition from the higher end of individual portfolio policy allocations to the long-term strategic objective levels, or a bit below. We are currently underweighted non-US developed markets and emerging markets allocations, which we will gradually raise to the long-term strategic allocations levels of each individual portfolio’s allocation policy. Emerging markets have a more attractive valuation level than other non-US international stock markets (although they pose significantly more volatility), and allocation to them may be raised somewhat above strategic target levels within individual permitted allocation ranges. For determination of intermediate trend status, we relay on our monthly 4-factor indicator. For more information about our trend following indicator and its performance implications, click here to see our descriptive video. United States – Expensive on Price-to-Book and Price-to-10yrAvEarnings and not expensive when earnings yield is compared to Treasury yields. However, when rates rise the comparison will worsen, making stocks more expensive. SKEW: SKEW measures the relative options “implied volatility” (essentially price) of S&P 500 out-of-the-money PUTs versus out-of-the-money CALLs with strike prices the same distance from the market price – essentially measuring the perceived “left tail risk” (tail risk is the probability of prices going below the level that is predicted by a normal probability Bell curve). Portfolio managers are predisposed to buy PUTs for protection and sell CALLs for yield, which tends to increase out-of-the-money PUT premiums and depress out-of-the-money CALL premiums. SKEW of 100 means the market expects equal implied volatility (essentially prices) for out-of-the money PUTs and CALLS. SKEW greater than 100 means the market expects higher implied volatility (prices) for PUTs relative to CALLS – more perceived large downside risk. The record low SKEW was 101.9 on March 21, 1991. The long-term average SKEW is around 115, and the high is around 150. The current 200-day average SKEW is about 130, and the current level is about 140. That means there is a heightened concern about a greater than typical risk of a large downside move in US stocks. INDIVIDUAL EQUITIES PUT/CALL RATIO: The Equities PUT/CALL ratio is the PUTs volume divided by the CALLs volume on individual stocks. This tends to be reflection of actions by retail investors; and is often a contrary indicator. INDEX PUT/CALL RATIO: The Index PUT/CALL ratio is also the ratio of the volume of PUTS and CALLS, but tends to be a reflection of the actions of institutional investors; and is not considered a contrary indicator. Over the past year, US stocks (VOO), non-US Developed Markets (VEA) and Emerging Markets (VWO) are generally in an up trend, although the US is way out front. Over 3 years, the three regions are up, but the US is way ahead, and did not have as severe down moves as the other two regions. As you will see the outperformance by the US is related to its current overvaluation, and the weaker performance of the other markets, is related to their more attractive valuation. Our 4 factor monthly trend indicators ranks each of the three regions as in an up trend. This time series of our trend indicator for the US shows the up trend established since March 2016. The up trend in non-US Developed Markets was established in November 2016. The up trend in Emerging Markets was established at the end of December 2016. On price-to-book basis the US is very expensive (at the top of its 10-year range). Non-US Developed Markets are “normally” valued (at just above their median level). 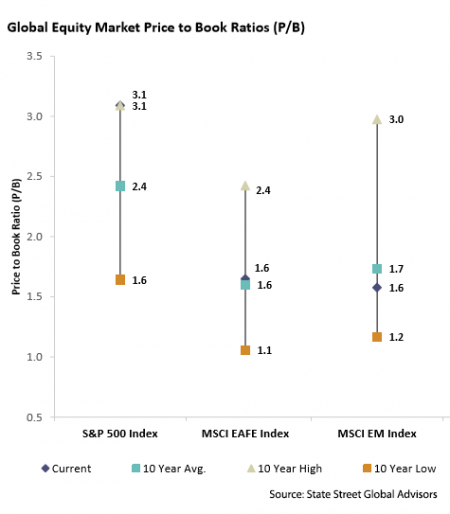 Emerging markets are inexpensive (price significantly below their median level). In terms of the Shiller CAPE Ratio (price vs 10-year inflation adjusted average earnings), the US is very expensive relative to is long-term history. Developed Markets are inexpensive, and Emerging Markets are significantly inexpensive. Based on a variety of valuation metrics the US is expensive. The Developed and Emerging Markets inexpensive by comparison. Emerging Market have more attractive valuations than the Developed Markets. In terms of profitability, the US is tops, which partly explains the higher valuation. Developed Markets are less profitable than Emerging Markets. Emerging markets have competitive dividend yields and the lowest payout ratios. Emerging markets seem to be a bit less leveraged than US stocks, and the Developed Markets are the most levered. 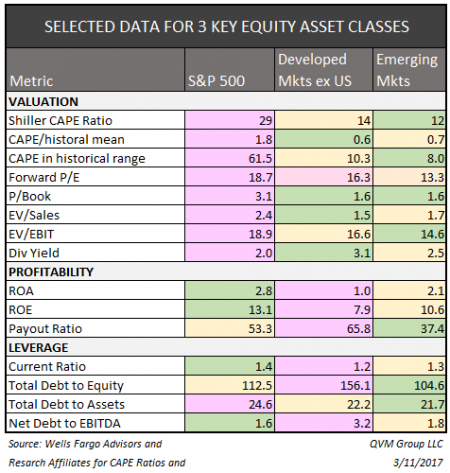 VALUATION of US ALONE …. The “equity risk premium” [(stock earnings / price) – (10-yr Treasury yield)] is the only key valuation metric that suggest that stocks may not be overvalued; and that argument depends of the current historically low Treasury yields. 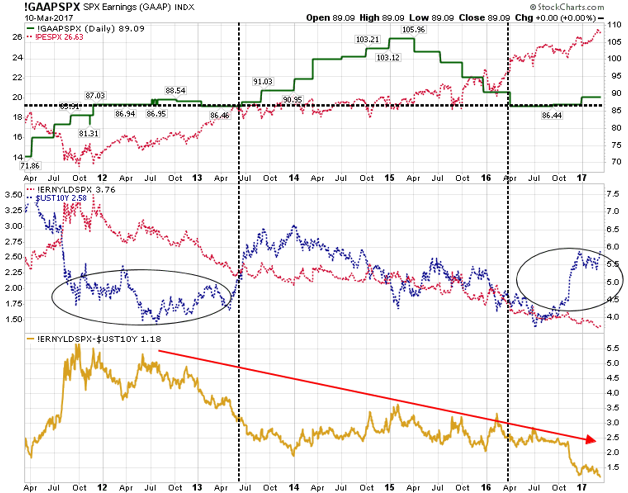 Current equity risk premium for the 10-year inflation adjusted earnings-to-S&P 500 price is 0.90%. Since 1881, the equity risk premium for the S&P 500 and its large-cap precursors was higher 68% of the time. That suggest modest overvaluation. However, since the risk premium first went negative in 1964 (except for 4 months in 1929), the equity risk premium was only higher than now 30% of the time — a Bullish suggestion. The question is whether the 135 history, or the 52 year history is the more important to consider. If the long history is more important, then the S&P 500 is somewhat expensive relative to the yield on 10-year Treasuries; but if the shorter history is more important, then the S&P 500 is inexpensive relative to Treasury yields. However, Treasury yields are suppressed, and if they normalize to something in the 3% to 4% range before profits increase a lot, then stocks are expensive. 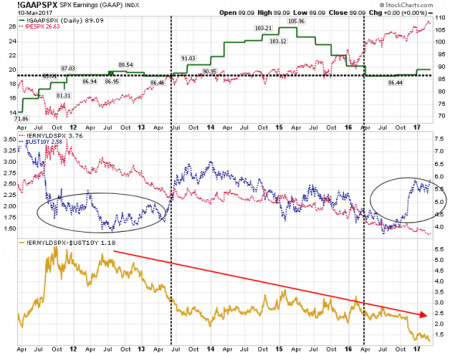 Current equity risk premium for the 12-month trailing earnings-to-S&P 500 price is 1.17%. Since 1881, the equity risk premium for the S&P 500 and its large-cap precursors was higher 68% of the time. This also suggests moderate overvaluation. However, since that risk premium first went negative in 1967 (except for 1 month in 1921), the equity risk premium was only higher than now 29% of the time — a Bullish indication. The question is whether the 135 history, or the 49 year history is the more important to consider. 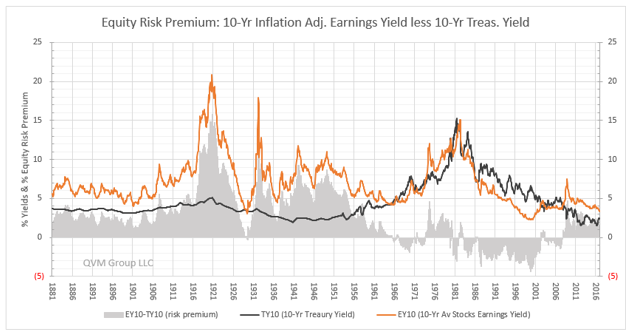 The same logic applies as it does for the equity risk premium based on the 10-year inflation adjusted earnings yield. S&P 500 GAAP earnings are not much higher than they were 4 years ago, yet the price of the index is a lot higher. That means much of the rise in the price of the index is merely paying more the what you get, not getting proportionately more for paying more. 10-year Treasury rates in 2013 more than doubled from less than 1.5% to more than 3%, yet the S&P 500 continued to rise in price faster than earnings. Once again 10-year Treasuries have risen in 2016 from less than 1.5% to more than 2.5% and the price of the S&P 500 has continued to rise, even in the face of flat earnings, with falling earnings close behind in the rear view mirror. 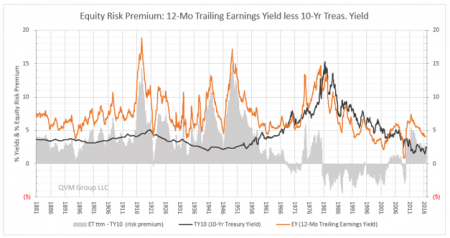 If interest rates should make it to 3% in the near-term (not an unthinkable event), the equity risk premium on trailing 12-month earnings would drop from 1.17% to about 0.75%. Since 1881, the risk premium has been higher than 0.75% more than 70% of the time; and since 1967 it has been higher 64% of the time. That would be Bearish. This suggests valuation vulnerability in the face of probable moderate interest rate increases. 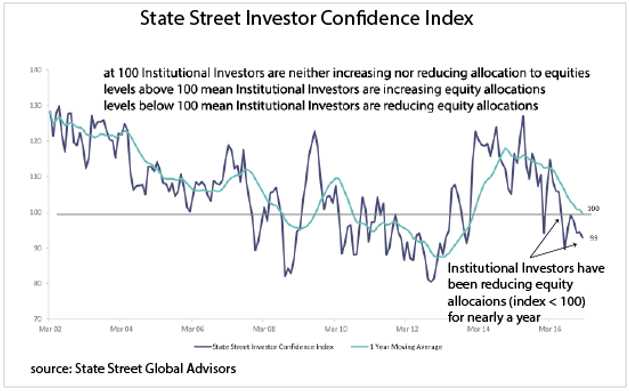 The State Street Investors Confidence index is a behaviorally measured sentiment index — a measure of increases or decreases in public equity allocation in actual institutionally managed portfolios, a real measure of market sentiment by large institutions. The rate of increase in their public equity risk allocations began a decline in around 2 years ago. They began actually decreasing their public equity allocations in 2016 and continue to do so. This is not an endorsement of current stocks markets. Investors Intelligence monitors 100 leading investment newsletters to gauge the Bullish or Bearish sentiment of those writers. Extreme peaks in sentiment tend to be contrary indicators (not perfectly, of course), but when “everybody” is Bullish or Bearish, a trend is often about to be exhausted; because there are few additional people to join the point of view and bring move more money in the direction of the trend. 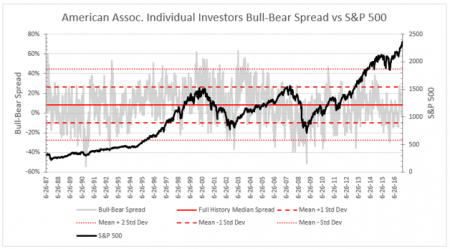 The current Bull-Bear spread is among the most extreme Bullishness of the last 10 years. This suggests that a corrective action is likely nearby. The American Association of Individual Investors conducts a continuous online survey of it members — essentially the retail investor. Last week when this chart was created, the Bull-Bear spread was 2.29%, barely on the Bullish side of neutral. In the subsequent week it turned on a dime dropping to negative 16.5%; strongly Bearish. 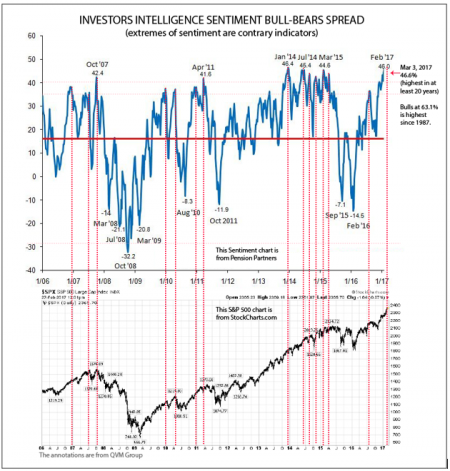 The chart suggests that this data is more a coincident indicators than a forward indicator, so the drop in sentiment parallels the recent weakness in the up trend. 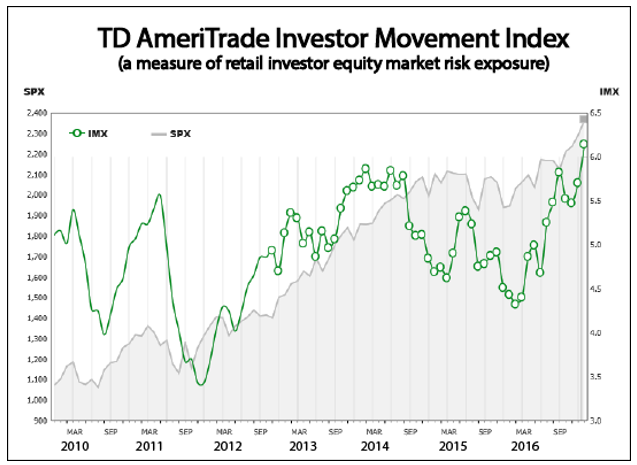 TD Ameritrade publishes the Investor Movement Index. It is Bullish at this time. Here is what they do to make their index. 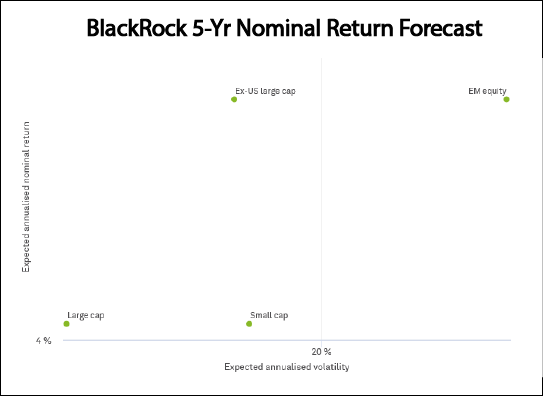 Each month Ameritrade calculates a short-term Beta (volatility relative to a benchmark such as the S&P 500) for each security. Then it takes a sample of hundreds of thousands of customer accounts with at least $2,000 in their account and in which at least 1 trade was done the month, from its approximate 6 million customers. It measures the total equity allocation and the aggregate short-term Beta (volatility relative to volatility of the S&P 500) of the equities in each portfolio (and other undisclosed factors) to develop the risk level of each portfolio. Then equal weighting each account without regard to size or number of trades, it finds the median equity risk exposure, and puts that on its index scale (scale parameters not disclosed), and plots that versus the S&P 500. The level and direction of the index is an indication of actual retail investor behavior instead of what they might say about their sentiment. The options market reveals the actual risk taking behavior of investors in terms of the pursuit of gain (buying CALLs) or seeking protections (buying PUTs). Here are 4 measures of options market behavior. VIX measures the expected volatility of the S&P 500 over the next 30 days. At under 12, the VIX is well below the 10 year average of about 20, and among the lowest levels of the past 10 years. This is complacency. Complacency is probably like everybody being on the same side of a boat, which makes the boat prone to tip over. Volatility is a mean reverting measure, which suggest more volatility in the relatively near future than in the relatively near past. 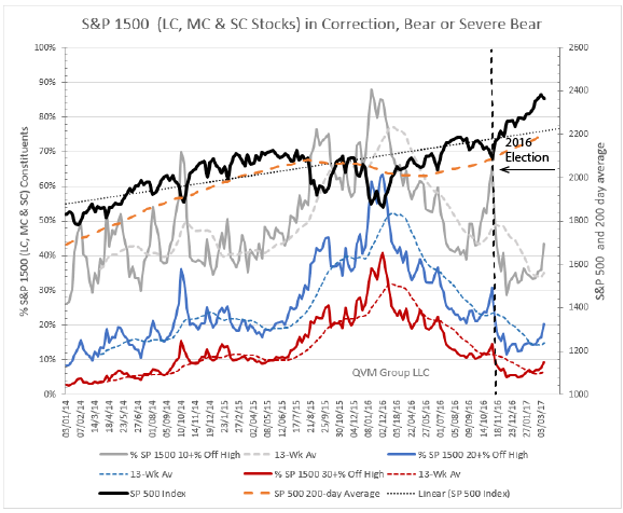 The SKEW Index (defined above in the jargon section) is a measure of the concern over the size and probability of an unusually large downside move. That measure is elevated, which gives reason for caution. 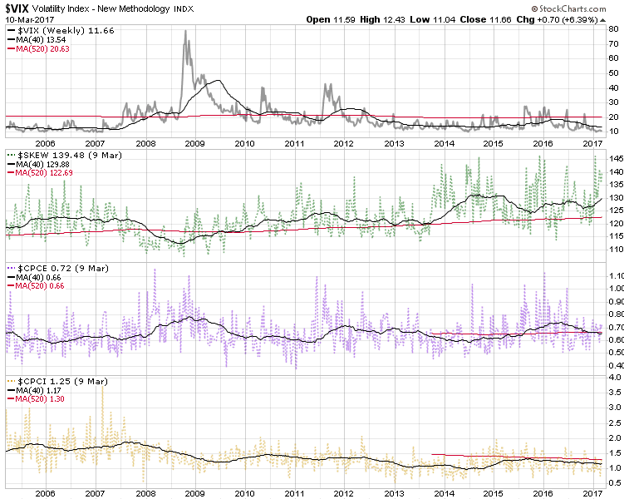 The Equity PUT/CALL index (defined above in the jargon section) is a measure of the relative “protection seeking/opportunity seeking” behavior of mostly retail investors. That ratio is slightly elevated versus average levels, indicating a mildly increased relative pursuit of protection. 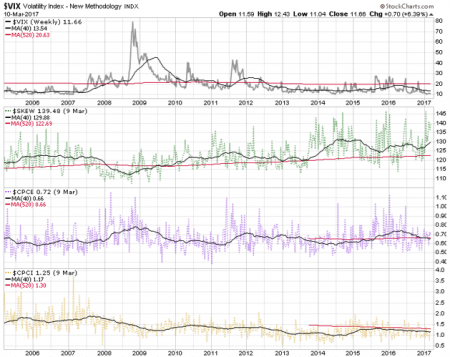 The Index PUT/CALL index (defined above in the jargon section) is a measure of the of the relative “protection seeking/opportunity seeking” behavior of mostly institutional investors. That ratio is slightly lower than average, indicating a mildly lower than average relative pursuit of protection. This is one of our favorite measures, and one that we directly measure weekly since the beginning of 2014. Breadth measures the condition or behavior of the overall membership of the broad S&P 1500 index and compares it to the price level of the market-cap weighted S&P 500 index — in other words, it checks to see if the rank and file members of the market are going in the same direction as the mega-cap leaders of the market. For example, the price movement of Apple and Exxon have a lot more impact of the price of the S&P 500 or the S&P 1500 than 100’s of smaller members of the S&P 500 and S&P 1500. If the rank and file are going in the same direction as the leadership, that is Bullish breadth. If they are going in the opposite direction, that is Bearish breadth. The leaders can only go so far for so long without the rank and file coming along. 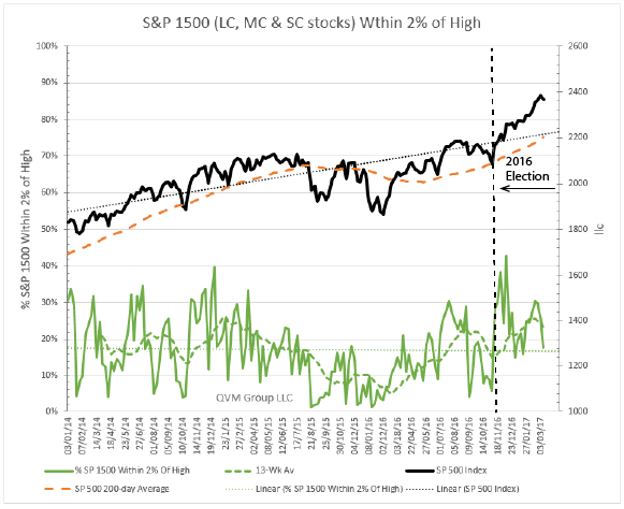 The percentage of S&P 1500 index constituents in a Correction or worse (grey line — down 10% or more from their 12-month high) rose dramatically before the November presidential election, then dropped off just as steeply to among the lowest levels in the past 3 years. Just recently, however, the percentage in Correction or worse sharply turned up — still in “normal” range, but the direction change is a negative for the current stocks rally. The same is true, but to a lesser extent for the percentage of S&P 1500 stocks in a Bear or worse (blue line — down 20% or more), or in a severe Bear or worse (red line — down 30% or more). The percentage of S&P 1500 stocks within 2% of their 12-month high was declining prior to the election, turned up sharply to reach the highest level in the past 3 years immediately after the election, but has since declined to the “normal” range with a current downward direction. The provides a note of caution about the current rally. 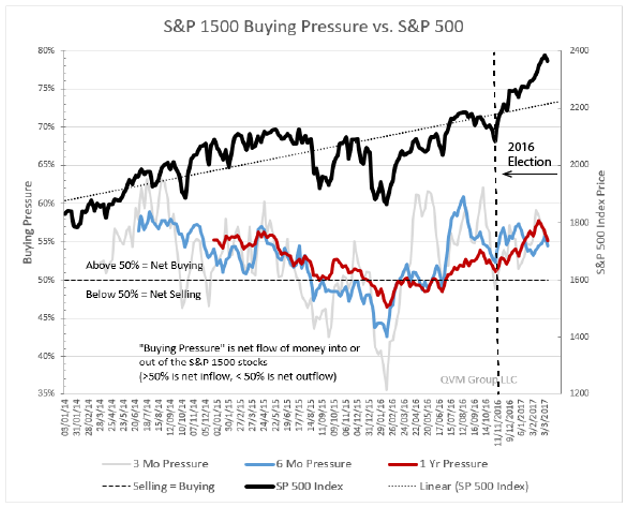 The Net Buying Pressure (Buying Pressure / Sum (Buying Pressure + Selling Pressure), which has been net positive since the bottom of the early 2016 Correction, began to decline before the election; resumed growing strength after the election; but has recently been losing steam. This is not supportive of the current rally. 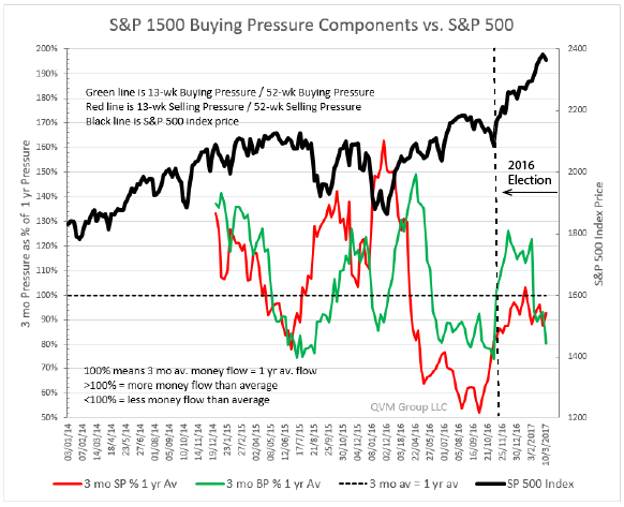 The separate Buying Pressure and Selling Pressure components of the S&P 1500 stocks Net Buying Pressure in the figure above are shown here. The rising S&P 500 price in 2016 was not matched by rising Buying or Selling Pressure, showing waning enthusiasm for equities. 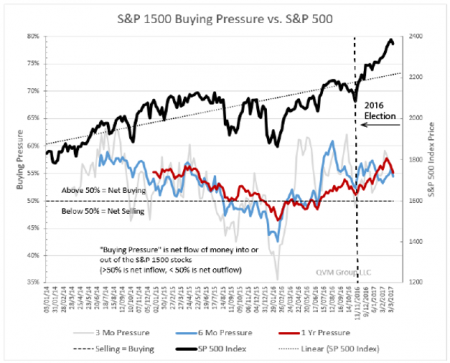 After the election both Buying and Selling Pressure rose, but Buying Pressure rose more than Selling Pressure. Recently however, the decline in Net Buying Pressure noted above, is the result of Buying Pressure declining substantially, while Selling Pressure has declined far less. These data also suggest the fuel of the rally may be running low. 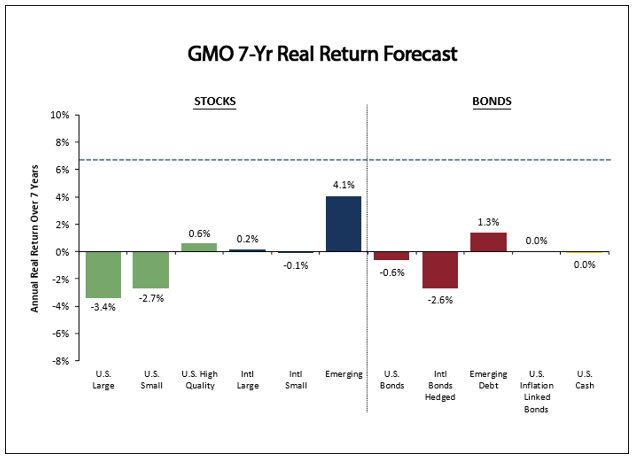 Looking way down the road with 5-10 year forecasts, and supporting our view that a shift in allocation more toward international equities, and less in US equities is appropriate, are forecasts by Research Affiliates (a noted factor-based asset manager), by GMO ( a Bearish asset manager for the very wealthy — $10 million and up to invest in their funds); and by BlackRock (the largest fund manager in the world). 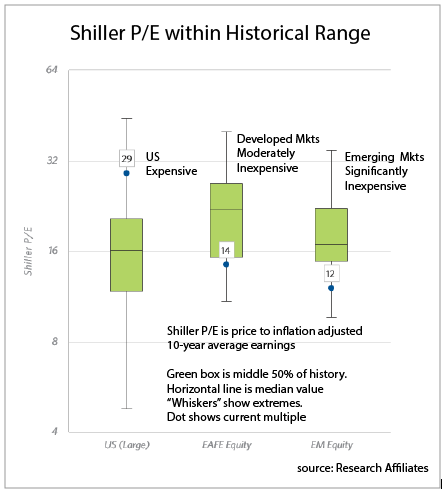 Research affiliates studies factors with focus on the current Shiller CAPE Ratio (Price divided by the inflation adjusted 10-year average Earnings) relative to its historical median, and historical highs and lows. They find that to be a good long-term indicator of opportunity. They view the CAPE Ratio as mean reverting over the long-term. 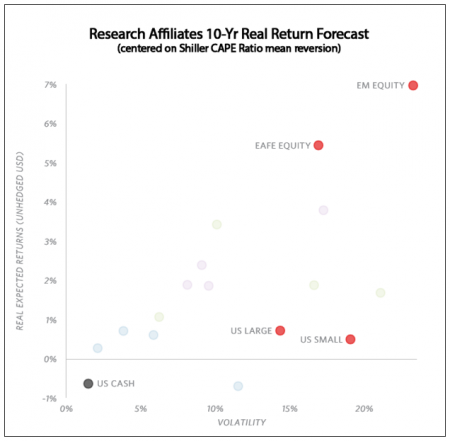 Based on CAPE and other factors, this chart shows how they see the real (nominal less inflation) return and the volatility of US, non-US Developed Markets (“EAFE”) and Emerging Markets (“EM”) working out over the next 10 years on an annualized basis. They definitely see international equities as the place to be — but with more volatility. 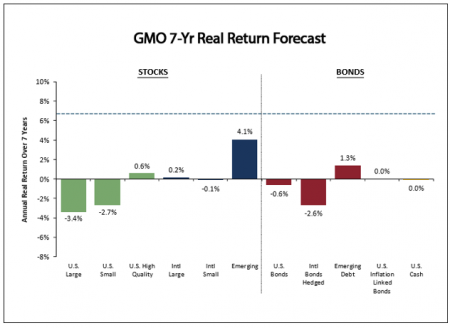 GMO does not disclose their forecasting methodology, but they are among the most Bearish institutional manager, so worth noting for that. Over the next 7 years, they see the real return on US large-cap stocks as negative 3+%; the real return on large international stocks as barely positive; and the real return on Emerging Market as positive 4+%. They also see negative real returns on US and Dollar hedged international bonds, but positive 1+% real returns on Emerging Markets debt. Over the next 5 years, BlackRock sees nominal return on US stocks as very low, and much lower than international stocks. They see non-US Developed Markets stocks as generating nominal return at about the same level as Emerging Markets, but with volatility similar to that of US small-cap stocks; whereas they see much higher volatility for Emerging Market stocks. This entry was posted on Monday, March 13th, 2017 at 2:24 PM and is filed under Allocation, Analysis, International Stocks, market condition, market conditons, market outlook, technical analysis, trend following. You can follow any responses to this entry through the RSS 2.0 feed. Both comments and pings are currently closed.